It was a small crowd: 41 people, including representatives from thirteen of the sponsoring companies, and eleven of our own students. A total of six teams had submitted a design to the competition (four from Edinburgh, one from Heriot-Watt and one from Strathclyde). 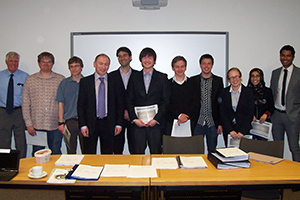 In the end, the clear winners of the first prize were the "Three Chemengineers" team from Heriot-Watt, Andrew Gunn, Daniel Marsden and Klimentiy MacKenzie. Their very professional looking report was of the quality you?d expect from a 4th year design project. However, I was very pleased to see our 2nd year students Greta Maciuleviciute, Shaima Al-Taee and Gytis Kairys ("team Greenshock") win the 2nd place. Pure grit, organization and enthusiasm with a bit of 2nd yr level chemical engineering knowledge took them far! Our 3rd year students James Ferguson and Erich Essmann ("Iron team Einsteinium" ? an interesting alloy) won a well-deserved 3rd prize. Our 3rd year students Peter Thomson, David McDonald and Jamie Freyne (team Enginuity) won the prize for best presentation, which was decided by an overwhelming majority of the votes from the sponsors. I would also like to mention our 2nd yr students Wu Songze, Keith Cho Yuk Ki and Yuen Chun Kit, our team "Get some" who produced an interesting design based on water filtration and purification. These four teams who made it to the finish line were from an initial line-up of nine teams from Edinburgh University, giving you an idea of the amount of effort that was required to complete the assignment. My appreciation goes to all nine teams.